It is hard to believe (still) but Giancarlo Stanton is close to taking the field as a member of the New York Yankees. 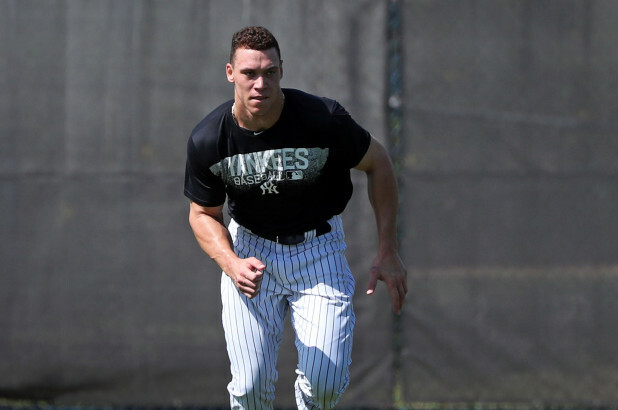 I've enjoyed seeing the early camp photos of Aaron Judge, Didi Gregorius, Gary Sanchez, Gleyber Torres, Miguel Andujar, Greg Bird and other position players ahead of Sunday's reporting deadline, but clearly, the appearance I've been waiting for the most is the arrival of Giancarlo Cruz Michael Stanton. Stanton indicated that he arrived early to take everything in and adjust to the time zone since he's a "West Coast Guy". Regardless of his reasons, I am ready to see him on the field with his new teammates sooner rather than later. Based on his words, Stanton understands the goal in the Bronx. 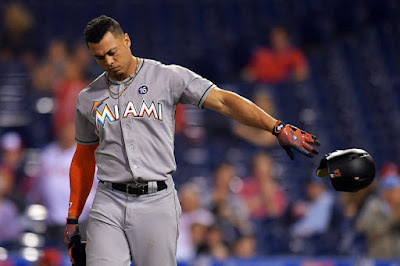 Per Bryan Hoch of MLB.com on the expectation of winning, Stanton said "It's huge. I've never been able to experience that at this level. This is a level I've worked toward my whole life and never been able to experience that, so I'm really excited for that aspect." Yes, we are too. Hoch went on to say Stanton added there is curiosity about how many homers he and Judge can hit, but "We can't worry about expectations when the main goal is to win. If our expectations help us win, then it doesn't really matter what the numbers are." But c'mon, all of us want to see massive numbers between these two. Triple-digit homers traveling many, many miles will be just fine. Good times in the Yankees Universe! Now that pitchers and catchers have reported to all camps, we're starting to see movement in the free agent market. In moves that indirectly impact the Yankees, the Boston Red Sox re-signed infielder Eduardo Nunez (pending a physical) and the Toronto Blue Jays signed lefty Jaime Garcia. Nunez might have been a nice cog to use for support in transitioning the rookies at second and third, but he's not a great defender and seems somewhat injury prone so it was no loss to the Yankees in my opinion. I never heard any interest with the Yankees bringing back Garcia but no doubt I would have preferred him in a spot start over Luis Cessa. While Garcia is an average starter at best, I'm sure he'll throw a no-hitter against the Yankees now. Seriously, I wish him well in Toronto but I am okay with the Yankees decision to let him go. The only negative is the loss of the pitching prospects that the Yankees sent to the Minnesota Twins (Zack Littell and Dietrich Enns) last year for Garcia. I liked the work Littell had done in the minor leagues last year prior to the trade. At this point, the only veteran free agent infielder that appeals to me is Neil Walker. I'd love for Mike Moustakas to sign a one-year "pillow" contract but realistically it is not going to happen. The Yankees are committed to keeping payroll under the $197 million threshold and I think the loss of $1 million in international bonus pool money represents a bigger detriment to the Yankees than the loss of the second and fifth round draft picks. Last month, Baseball America named the Yankees as one of three teams favored to sign soon-to-be free agent outfielder Julio Pablo Martinez from Cuba. If the Yankees truly have interest in Martinez, they won't sacrifice international bonus pool money for a one year of Moustakas. The Yankees have limited space available for the current 2017-18 signing period so they'd be looking at July 2nd for the next signing period once Martinez is declared a free agent by MLB. The only way the Yankees could justify losing the draft picks and the international bonus pool money would be a long-term contract for Moose Tacos and that's simply not going to happen as we await the eventual expected landing of Manny Machado in the Bronx. Last year, we knew almost immediately when training camp began who would get the Opening Day pitching assignment. New manager, new coaching staff, and a down year from the 2016 staff ace leave the decision a little more up in the air this year. The unquestioned (and surprising) leader of the 2017 Yankees Rotation. 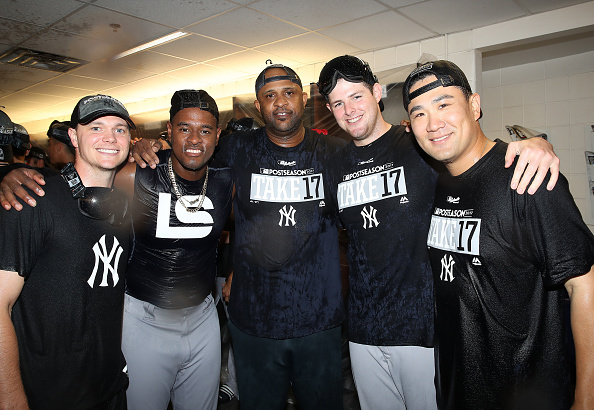 Sevy shared the team lead of 14 wins with CC Sabathia (he had a 14-6 record with 2.98 ERA in 31 games started covering 193 1/3 innings pitched). Severino also struck out 230 batters. He finished third in the AL Cy Young voting behind Corey Kluber and Chris Sale. If the decision is based solely on stats, Sevy is your man. The "recognized" staff ace had an uncharacteristic 2017 compared to prior seasons. His record was 13-12 with 4.74 ERA, however, he finished the year strong and was 2-1 with 0.90 ERA in the post-season against the Cleveland Indians and Houston Astros. His body of work for his four-year Yankees career (52-28, 3.56 ERA, 668 1/3 innings pitched, 30 starts) attests to his stature and continued rank as a leader of the staff. Personally, I feel that we'll see a more normalized Tanaka in 2018, pitching closer to his pre-2017 numbers. Okay, if we go solely on the basis of the body of work, Sabathia is the clear and undisputed leader as the most tenured member of the pitching staff. 120-73 in nine years as a New York Yankee, with a 3.75 ERA in 1,657 2/3 innings pitched. In 2017, CC was 14-5 with 3.69 ERA in 27 games started (148 2/3 innings pitched). If the decision for Opening Day starter is Lifetime Achievement Award, Sabathia is the choice. This is probably a sentimental choice as it could be Sabathia's final year in Pinstripes depending upon how the season goes. While it is possible that Gray may someday be an Opening Day starter for the Yankees, this is not the year. Sonny appeared in only 11 games for the games following the trading deadline deal that brought him to New York last year. He was 4-7 with 3.72 ERA over 65 1/3 innings. Granted, he didn't get much run support but he also did not help his own cause as he pitched better in Oakland than he did in the Bronx. Gray's goal for this year will be to set himself up Opening Day in a future season. He was just a rookie. No offense to Monty but he is the fifth starter until proven otherwise. He finished 8-7 with 4.07 ERA in 29 games started over 155 1/3 innings pitched. He did an admirable job as the fifth starter; much better than Luis Severino did the year before. This is a tough decision. I think that any of the top three (Severino, Tanaka and Sabathia) would make an excellent choice for Opening Day starter. Severino is probably viewed the current staff ace by most, but Tanaka has put up good numbers collectively over the past four years. Sabathia would be a wonderful choice to recognize how much the man has meant to the Yankees. For me, I'd probably go with Severino as the future face (or ace, however you want to look at it) of the rotation but with all sincerity none of the three would be a bad choice in my humble opinion.